I thought your guide was excellent and have been trying to implement as many changes as possible over the last few days including action buttons etc. If I purchase this template – will it damage the look and feel of my site or undo any of my hard work? (I’m not very fast at making the changes!). Is there a way of uninstalling or rolling back? Thanks for your help and excellent work. As with the installation of any contributions, you should always backup your original files so you have something to roll back to in the event you run into problems. Having said that, I have setup this template pack to use the built in Zen Cart overrides system. It does not require you to write over any core files. The files altered should be “plug and go”, however, once again, if you have made changes to your current files already, I would suggest making a backup before implementing. You may also feel more comfortable comparing the files within the template package to those on your site. You could then copy and paste any changes from the new files to your site. In most cases, this should not be required and you could just “upload and go”. However, due to the large number of other third party contributions available that make changes to files, and due to the fact that different sites install contributions that they see fit their needs, it is possible, as is with any contribution, that certain changes will affect your site in one way or another. I’ve made these templates with you, the end user in mind. They should be “easily compatible” and provide what you need with no headaches. Is there any way of rolling back? I like to simply rename the original files and leave them in their current directory. I would give them all a similar extension so they are easy to spot. Something like “xxxxx_file_PRIOR20.php” (as an example). That way, if you ever decide to roll back to the original files, all you have to do is delete the new version, and rename the original back to the proper form. I have already implemented the simpler steps you listed in your book on my site and can see the difference. In order to take full advantage of your pack do i have to install any other contributions such as the 4 step checkout bar you mentioned in your book or do these contributions come with the pack? From the 20 steps in the book how many are being included in your pack? Does the pack include implementation instructions? Glad you have seen the difference. Many months (sometimes years) of testing go into what I write and develop. The information I provide is based on real world successful examples that I have experienced with client sites as well as my own sites. A lot of it also comes from long hard research and testing. To take full advantage of the ability for the pack to help conversion, you should have the two contributions mentioned on this page. Both contributions come already installed with the pack. The only thing you will have to do is to run the SQL patch for the “Telephone Not Required” contribution. The package includes all steps that involved template alterations with the exception of the product page (which differs from site to site). Of the 20 ways, close to 10 of them involved actual template changes. 9 of those are included in the pack. They primarily deal with the checkout process beginning with the login page. Most Zen Cart stores I come across and work with seem to have this as one of the biggest problems. Thank you for a quick reply. Are you going to start a support thread on Zen Cart forum? This package will not be uploaded to the free contributions section on the official Zen Cart site (obviously) so I won’t be opening a support thread for it there. I will be supporting it (and any other “products” I offer) on this site. In the near future, I will be offering a “knowledge base” and “exclusive members” section to this site of which I will detail in a later post (when that time nears). I have found a large number of users are looking for more “personal” information on how to improve the conversion of their websites, and a “community membership site” is the best route to take for that level of information. I want others to benefit from the many sites I work with and the positive experiences I find through continual testing and marketing of those sites. The addition of an exclusive membership section will achieve that purpose. Is there step by step instruction for people with heavy modified store? The code is commented so you can move things as needed from within the files. The enclosed manual also gives more insight into that for users who want to “copy and paste” the code into their own site (rather than just “upload and go”). I’ve been to your store, and you should have no problem either way. In have installed the Remove / Bypass an Account Success Screen decriped in Surefire Way #3, page 20. Works fine if customer first fill the shopping basket and second create an account. But Creating an Account with an empty shoppingbag result in a warning messages the script could not run. So… how to deal with this? The proper code to use there is as follows. That was brought to my attention a while back but I guess I never posted the answer here. zen_redirect(zen_href_link(FILENAME_CHECKOUT_SHIPPING, '', 'SSL')); // Redirects the user to the "Shipping Information" part of the checkout (more streamlined). zen_redirect(zen_href_link(FILENAME_CREATE_ACCOUNT_SUCCESS, '', 'SSL')); // Original line of code that redirects the user to the "create account success" page. Adds another step to the checkout process, and is not needed for a more streamlined approach. That addresses and corrects the warning message by skipping the Create Account page only if there are items in a users basket. Will “Telephone Optional on Signup” Contribution work properly with 1.3.7+? Both your site and the zen-cart downloads are seem to imply that it is only for 1.3.6 and lower. Yes, this works on 1.3.7 + as well. I am running it on a few sites now with no problem. I just installed the templates, awesome work. Thank you. I have one issue however and I’m not sure how to fix it. I’m using the cherry zen template and the 20 ways conversion pack. Work well together except on the account signup split screen. The account signup is spanning the middle of the page and pushing the returning customer to the bottom. When you go to the page at first it puts you in the middle of the page. Please help everything else is awesome. Thank you and once again well done. Also, pay particular attention to the fields you are asking your customers to fill out when checking out as well. Things like asking for company name, age, fax, and in some cases phone number should be left off the form unless you really use them. Asking for information like that when you don’t need it will hurt conversion. Follow the commented out code there to remove sideboxes from the pages you want. To remove other pages you would add them after the word “login” and separate them by commas. The template for the product page does not includes the code needed to implement the “Cross Sell” module as well. Not everybody has the module iinstalled. Just take the code that is required for your cross sell module and delete it from the tpl_product_info.php page. Once you do that, the error message will go away. Just delete everything between it. 3. I have removed both sets of side boxes from check out pages but there is still not enough room for box at top. Do I need to increase total site width or am I missing something? It has been brought to my attention that a few users with various versions of Zen Cart notice this occurrence. It is because language file “button_names.php” that was included with the pack did not include the define statements for a few buttons (reviews, ask a question, etc..). To correct, you can do one of two things. 1) Start with your ORIGINAL button_names.php language filee and add the commented “new code” defines from the 20 Ways packet to your original file (copy and paste). It is only a few lines that are commented. 2) Option 2 is to take the missing defines from your ORIGINAL file and copy and paste them into the new 20 Ways language file for the buttons. Either way will correct the issue. This is site specific, so you would have to play with the width your site possibly. It depends on what you are trying to achieve. This is done from within your stylesheets. To control the width of the login page forms etc.. , you can use the “login.css” overrides file provided in the pack. You cannot control the entire site width fro that file though. Only the internal width of the forms etc.. on the login page. Thank you for the 20 ways ebook and templates! I installed them tonight and I too am having the problem with missing buttons. It seems to be the same problem that Ian is having. I looked at the code (trying to follow your steps above) but I’m confused about what to copy. Would it be possible for you to clarify what code to copy. Your help is greatly appreciated. The easiest way to find the define files is to look at your original button_names.php file and search on the constant name that it says is missing. If there were any changes made to language files with any third party contributions, you would want to add those in as well. In my opinion, the easiest way to go is to find the new lines added in the language file included with the 20 Ways, and then copy those lines to your original working language file. To do that, just open the language file included with the 20 Ways, and then look at the code in it. I have commented in it the lines that were added for the 20 Ways. You could copy those alterations to your original file and you should be ready to go. OK, I got the install pretty well going. Getting this error when – I add something to the shopping cart and than delete the item. I’m taken to the empty cart page. The following error(s) (warnings) are noted on the bottom. Those errors look to be related to maybe Google checkout module. They don’t directly relate to any module that is included with the 20 Ways templates. REMOVE that line of code and you should be ready to go. I haven’t installed the order steps as cherry_zen already had it in but would this effect the login? Hope you can help as it looks great. The changes that are made using the pack mainly affect design and layout. It should involve no code alterations that actually “work for logging users in”. So, unless you made some changes by accident while installing, the package should not cause this problem by itself. Can anybody comment on how easy/hard these changes are to apply to 1.3.8? I’m pretty good at PHP and understanding how this works, but my new site is 1.3.8 so before I buy this, I’d like to know how much is still applicable? I know 1.3.8 didn’t implement any of these strategies, so the concepts are valid. You do not need to be proficient in PHP to make these work, however, if you are, it will make it easier for you to implement (as sometimes understanding the “how” helps understand the “why”), but again, it is not a requirement. Implementation into 1.3.8 should be fairly simple. The majority of changes are DESIGN related (so they affect the “tpl_” file sets). There are a few that alter modules (again though, these are DESIGN related). My recommendation for implementation into 1.3.8 is to simply take the design alterations from the template pack, and since you know PHP, copy them into your working 1.3.8 site. That way you are sure they work smoothly. Basically, since the template pack revolves around the DESIGN aspects of zen, it should integrate pretty easily with any version over 1.3.x. There’s an error in the Button_names.php file. To match the graphic file name. Actually, this IS due to the conversion pack…it uses a version of the file “tpl_login_default.php” that’s slightly dated and missing a critical new feature. ZenCart has added security tokens to verify login information, these tokens are not included in the Conversion Pack file. It’s an easy fix with BeyondCompare…but could certainly use an update in the Conversion Pack, to avoid confusion. Yes, you are correct. The error here is only seen on Zen versions 1.3.8 + in which a security token was added to the login form to tighten security. 1. When you add something to the cart the checkout link appears on the top left nav. Per your suggestion I want to make that stand out. I was able to make it bold with sloppy html tags in the tpl_header.php file but can not figure out how to wrap that bit of code for the checkout in CSS, so I can really make it stand out and control the style. Whenever I attempt it, the whole page disappears. 2. If you proceed to checkout I have installed your mod. It works well but the two columns have a large gap between them. What would I edit to tighten all that up? I really like the registration/checkout setup, but I’m having some problems. Some of them I’ve been able to fix like the buttons, although it would be nice to have a button that says Ask a Question rather than using the Read the Reviews button. I’ve not had any luck trying to create a similar one. And there were no buttons for the restocking section and I kept getting an error so I finally deleted that section from the tpl_product_info_display.php file. But my biggest problem right now is that I cannot get the order checkout (tabless) to move beyond step 1 if you are a registered customer and enteriing personal information if you are a new customer. And it goes to my original registration page, but you never get anywhere else. I went to the Zen Cart forum and also put this question to Clyde who wrote the Order Steps Tabless mod but he suggested that I talk to you since you incorporated it into this kit. Also if you click on the “ask a question button” I get a 404 error. I don’t know that I ever had an ask a question button or page before. So was there a new as a question page file created? I didn’t see one. I really want to get this all working as the gardening season is upon us and I need to get these bugs worked out so people can set up accounts and buy stuff. I guess I should not have put this on my live site. I’m not the most techncial of people, but I’m learning fast, but there are lots of php syntax stuff that I don’t understand. Still I’m getting better each time I add a mod and fix an error. So any help will be greatly apprecicated. Thanks in advance. I’ve been able to fix like the buttons, although it would be nice to have a button that says Ask a Question rather than using the Read the Reviews button. I’ve not had any luck trying to create a similar one. Actually, you did this incorrect. You tried to implement the “reviews” button with the “ask a question” option (which your template does not have installed). So, what you want to do is to delete the section that uses the “ask a question” in the tpl_product_info.php page. Make sure you LEAVE the actual “reviews section” in the template. To activate that, you will need to turn on “reviews” form within your Zen Cart admin. And there were no buttons for the restocking section and I kept getting an error so I finally deleted that section from the tpl_product_info_display.php file. No problem here. You are correct to delete it if you are not using the “restock authorization” mod. I cannot get the order checkout (tabless) to move beyond step 1 if you are a registered customer and enteriing personal information if you are a new customer. And it goes to my original registration page, but you never get anywhere else. This has to be related to something you did when installing. I’ve never had any reports of this issue, and have never seen it happen with a good install. Since I don’t know what you may have altered here, I can only give you a suggestion based on what might have occurred. I would check the files you altered during the checkout process and make sure you did not remove anything that is related to the user actually checking out (moving forward). The checkout steps module should have no effect on the ability to move forward or back through the checkout. It only provides a graphical representation of where the visitor is during their checkout process. This is because of how you tried to integrate the “reviews” button with the “ask a question” option. Remove the section “Ask a question” from the tpl_product_info.php page and you should be ok here. You are not using that optional module anyhow (third party add-on). I have installed the 20 ways. I have been able to correct most of the problems by reading the psot above. I would like to know how to add information to the two boxes on login page. One box is “Shop with Confidence” and the other is “Customer Service”. The only thing I did in terms of fixing the buttons was to remove an additional alt tags but the reviews button was already in the buttons define file for use as the ask a question button. I didn’t add it I wouldn’t mind having a mod that added that feature but I sure wondered about the use of that button for that aspect. I’ll turn it off for now. Maybe I’ll find that mod later on. thanks. I’ve not done anything to the checkout process that I know of in any of my mod installs. Any idea of what files I should check? I have installed a fair number of mods, but none involved the checkout process that I know of unless the newletter mod might have affected something. Could that be the problem? I really want this conversion kit to work. If I have to take the news letter out I guess I’d rather do that, but I’m not sure how I’d remove the sql stuff. I’m only so technical. I would like to know how to add information to the two boxes on login page. One box is “Shop with Confidence” and the other is “Customer Service”. To alter the text in those boxes, you need to open up the “tpl_login_default.php” page. You’ll find the sections with that code in there. I bought the conversion pack today and am excited about implementing the changes on the website I’m working on. One thing though, is there a way to get the psd files of the action buttons so that I can change the background color? My color theme is red and white, using a green action button might make it look odd so I wanted to change it to orange. I’m a newbie and need some hand holding on this. I have just installed the conversion pack and have gone into my first stumbling block. On the login page, I have successfully disabled both left and right side boxes but how do I fix it so that the login details are in the middle? Can’t understand why my product info display looks the way it looks? The checkout button doesn’t show. I don’t personally have the PSD files, but you could easily recreate them if needed on your own photoshop install. I tried to make it flexible enough to allow anyone to create their own buttons. You would have to know some graphic work to do this obviously. I would recommend creating your own buttons in photoshop and then replacing the ones I have in the pack with those that fit your needs. For this you will want to alter the stylesheet for the login page that came with the pack. You can adjust the width to your liking to get the two columns in the proper locations. Depending on how proficient you are in working with CSS, it might require some trial and error on your part. The key is that all alignment etc… is done from within the stylesheet. Adjusting the widths will get you the look you are seeking. Unless you put it there personally, the checkout button will not appear on the product_info pages? The Add to cart button does, and by looking at the following page, it appears from my end that all is in place OK? Another bug(? ), just like the post of Kathy, for some reason, the button for Ask a question is using the read a review button. I have the ask a question module installed along with the the button for it but I don’t understand why it keeps picking up the read a review button on it. so that the original file is not overwritten? The original file is actually the same as the one provided. They are not “core files” as such. So overwriting shouldn’t hurt anything. I have the same question as MII above. I’m using Cherry Zen and the account login screen shows as one column below the other. It only looks this way on IE7, but looks fine in Safari. I disabled the left and right sideboxes first. Is it because I still have space for the sideboxes even though the boxes themselves don’t show? Eric: Thanks for the great improvements. Can’t seem to get the button problem straightened out though. I deleted the “ask a question, review”, etc out of the tpl_product_info.php file as I have not been able to get them to show- need to get back up and running. I tested checkout process and I’m very happy with the style. Upon checkout completion there is a spot for a “logoff” button that does not show. Although the link works and logs the customer out of checkout. Why can’t the updated page files find the button images? Will you be so kind as to explain where your code is looking for the button images so I can be certain they are in the correct file location. loved the download book, and at last bought the download. have spent the better part of 2 days implementing the download. many items not formating the way i had them and painstakingly going thought the “differences” for 1.3.8a. now going back and forth between stylesheet.css and tpl_product_info.php trying to get format back on product page. ie cat prod #; prev, list, next buttons are no longer center top, add to cart no long right with dotted line around it. am stuck with my products page way off the mark. as others have mentioned “Ask a question”, “Tell A Friend”, “Write a Review” is broken. looks like ‘Button_Image_Mail’ isn’t defined in button_names.php giving 404 error. if you have updated these files over the last seven months i would sure like a newer copy. love you efforts and website that keeps us all growing and thinking. working on tpl_product_info_display.php and see “bluePixel.gif” referred to four times with out the image in the files. is this a file that was left out of the download? i fell back to the “tpl_product_info.php” from the ‘template defalt’ as there were to many unknown items in your included downloaded tpl_product_info.php file. i will need to review the bottom links for “ask a Question” Write a review” to add them. Just replace all occurrences of #indexHomeBody with #loginBody . I noticed the login page doesn’t look totally identical–the example in the pdf shows boxes around the headings such as in “New Customer? Please Start your Checkout Here” and “Create a Password…” My page has the words, but not the boxes around them. Is this a function of the template I’m using? Or is there something I should tweak in login.css? Hi, sorry, just one more question. I noticed that Forgot Your Password? is right next to the Continue button. And even though Forgot Your Password is a link, it isn’t underlined. This makes it look like you need to click on Continue if you’ve forgotten your password. Do you have a quick tip for how to make the Forgot Your Password link be underlined so that it’s clearer that they need to click on the words and not on the Continue button? Ignore my post dated July 29th please… Had a lot of problems. So did a fresh install of WAMP and ZenCart. I then unzipped your files changing Your_custom_template to merlin as you described. NOTE: Zen Cart database-upgrade scripts should NOT be run from this page. Please upload the new zc_install folder and run the upgrade from there instead for better reliability. Question: how do I run an upgrade from that folder please. Back again. I have entered one product. S001. I added it to the cart and received the following error..
Help please. Newbie here. As you have probably gathered. Using Zen Cart 1.3.7 with PHP ver 5.2.5 and Apache2. I used the 1.3.7 plus installation. I still have the original Log In form coming up. Unfortunately, I am using a localhost to build my site and seem to be going round in circles. I have the same question as MII above. I’m using Cherry Zen and the account login screen shows as one column below the other. It only looks this way on IE7, but looks fine in Safari. I disabled the left and right sideboxes first. Is it because I still have space for the sideboxes even though the boxes themselves don’t show? Upon checkout completion there is a spot for a “logoff” button that does not show. Let me see if I can answer your questions in one post. This is a file that is no loger used. It is safe to remove and will be out of future releases. I have heard this from others and an planning on updating that file along with the associated language file to work out that. If you haven’t yet completed this let me know and I’ll get you a copy first. The PDF is for example purposes. If your stylesheet does not have that option then you likely won’t see the “outlines”. Alter your stylesheet to “underline” hyperlinks. You can further this thought by developing your own unique style for whatever link(s) you wish on your site. That will do the trick. Follow the on screen instructions provided by Zen Cart. But keep in mind, this is NOT how you would install a third party module (as in this case). For all of those you use the Admin “SQL Patch” interface found under the Tools menu. Sounds like you installed something incorrectly or have a PHP error on that referenced page. I would suggest going back and starting from the beginning. This again is not a problem related to the module itself, but in relation to your zen cart install over all. From the admin turn off “split screen login” as documented in the instructions. If you install everything correctly you should see the new form. eric, i have not completed this. i would welcome your update. I did a complete re-install and using the Classic Template every is good and working. I received no errors before the conversion. Running your conversion pack. As stated up to a point all your info is good. I am still getting the Parse error. However. I renamed your tpl_shopping_cart_default.php (we will call it tpl_1) . I then copied the tpl_shopping_cart_default.php (we will call it tpl_2) from the template_default folder into ..\merlin\templates. It all works – yet because tpl_2 is the original then no changes are seen. It appears then that there is an error somewhere in tpl_1. I am not a php person at all, although VB6 and C+ coder. so I will attempt to do a side by side comparision of tpl_1 and tpl_2 and see where we go from there. I have found one error in your tpl_shopping_cart_default.php. I have downloaded the new 1.3.8 zen cart. I have started working thru the process of redoing the file in the 20 Ways. I have saved the down load from April, 2008 but can not fine the SQL patch for the Telephone Number Optional module. Where is in located in the 20 Ways files? I noticed that installing the files made changes to the product details page that I don’t see mentioned in your book. For example, “Price:” was added in front of the price, “Ask a Question” and “Read the Reviews” buttons were added, and the side columns disappeared. Is there a reason why these changes weren’t mentioned in the book but are in the tpl_product_info_display.php file? (Hard-coding “price” won’t accommodate multi-languages properly). You must download the SQL patch for that from the Zen Cart downloads section. That is mentioned in the book that comes with it along with the link to that page. This file was kind of a “bonus” with the 20 Ways. I included it after testing which did not “yield results” until after I completed the book. That is the only reason it was not mentioned. I have had no other reports of that at all. It must have been deleted somewhere during your install or upon installing other items associated with that file. There should be no parse errors at all (again, no reports of this, and I can’t duplicate it). It sounds like the issue is somewhere in your “custom” template. I would suggest starting with the “default_template” (which you state is working fine) and then “migrate the changes over to that. That should get around any issues you may be having. Again, it sounds like somewhere during your install or working with that file, some lines of code were altered which should not have been. I have an updated version being released (only to remove the unused items) so that future users will have this. Do you need a copy when I get that in place? It may be best for you to update it on your end rather than get my update as you already know what you want to remove and my version will simply do the same thing. It will avoid you needing to install something else when yours is working as is. as i work on the updates / install expecting improvements i get this from a customer and she is correct. i see changes to tpl_modules_create_account.php in our template/templates/ directory and am stumpt at getting this corrected. all orders have been via paypal. 🙁 HELP! As per the instructions you DO need to set the phone field to BLANK (nothing) so that is not a temporary fix … it is the correct way to install it. That is default zen cart procedure for making a field not required (set it to blank in the admin). Make sure you go through each part of the install instructions to cover all the bases so you don’t miss anything. Oftentimes if an element is missed, it can cause problems not expected originally. Likewise, the changes to the tpl_modules_create_account.php page are to re-work the layout of that part of the login / registration page. There should be no affect on how or if they use Paypal to checkout. That is stil; an option with the new look, but the tpl_modules_create_account.php page has nothing to do with that at all. Also, as per the instructions, if you make changes to any of the files, they should be uploaded to your own “custom” directory (what ever that may be) to avoid overwriting any files in the process and still leaving the zen cart functionality intact. thank-you for your response to my earlier post. unfortunately my question was obviously not clear. I can see where to add the links to the privacy/shipping info etc pages into the boxeson the “tpl_login_default.php” page. I don’t know what – what is the code for an internal link? i’ve tried searching the zencart help forums but have not found anything that works. Please help! 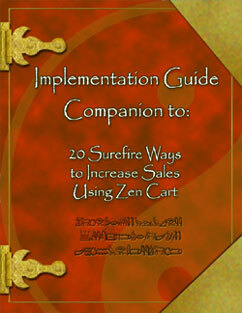 Eric – I really like you’re adjustments to the flawed Zen Cart checkout process and I want to implement them ASAP. I know this is a thick question! I’m running Zen Cart version 1.38a – do I use the file set marked as 1.3.x or 1.3.7-PLUS? Thanks again for you’re help. I have an issue with the template showing a grey box underneath the dropdown for state. I have tried turning on the state field and leaving the dropdown turned on and the issue goes away, however, it completely removes the state dropdown box as well. Any ideas how to take your modified template and have it only show the dropdown for state rather than the “Ghost” box? I haven’t had any other reports of this and have never seen it myself as well, but can you tell me if it still shows when you switch to the default template (without the 20 Ways changes in place)? If it does, then the problem is one that stems from other issues in your cart. If it works fine then I’ll see if I can duplicate it here and get an answer to you. So far I have yet to be able to duplicate. Let me know how the above works and I’ll see what I can do to assist. You would use the 1.3.7PLUS versions. I am actually working to try to make it even easier for others to implement in the future but that is a short way off. You would need to get the links from the actual pages on your site. I typically tell people to copy and paste the link from their address bar while looking at the page they want to link to. Add that link as the one in the area you need. If you do not have pages for some of the items (like 100% Secure Shopping) then you will need to create these yourself using EZ Pages. The links I provide are simply suggestions based on what I see works. You can create as many or as little pages as you wish to include in those sections. Once created just navigate to the page in your browser and copy and paste the url in your address bar to the code in question and you’re set. 1) Getting rid of my sidebars for the checkout screens. 2) The only other thing that took me a little research was removing the Required Field asterisk from the Telephone of the Account Edit form page. Anyway, other than that, everything went swimmingly and I am quite happy with the results. Now that I’ve fixed the problems with Checkout –I’m ready to tweak the look of my site via CSS changes. Wish me luck! And Eric, thank you for the great product — worth every penny! In order to add additional fields to any form in zen cart, you would need to do some programming. My templates are basically “look and feel”. As long as you can add items to zen, you should be able to add them to the template. IU am having a problem getting the submit order button to show up. All I get is the alt text. Can you take a quick look and tell me what to change or whatever I need to do. Its been giving me fits and I am lost as to what file to change to get this button to start showing up. I am looking for some tips to have my submit order button to show up. All I get is the alternate text. I changed the image name everywhere that I could change the image name from btn_submit to btn_submit_order_green.gif and still no dice. My other question. When placing Customer service and Customer assurance links on the login page. Do you put them in an unordered list or just basic html links with anchor text with a line break. If you could be so kind to answer my question with a quick sample. Why don’t you make this thread into a forum? It would be easier to search for questions and answers. This will cut down on repeat questions making this comment thread harder to find answers. And a forum will help your site overall. Google loves forums posts and you can’t get long tail phrases like this anywhere else while your forum members are build these up for you. To get the submit order button to show up, you need to make sure you have included the piece of information into the language file to allow for this. There are a few edits that need to be added to that file. The define statement for that button should point to the name of the actual submit order button that you developed. By default there is no “submit order” button in zen cart which is why you are not getting it to show up just by altering the name of the file. Thanks for the idea on the forum. I have thought about that on a number of occasions and probably will implement one for the paid modules. For the site though in general, I’m going to keep that as is. Works much better for the objective overall. I am going through a re-design of this site right now and maybe once that is in place (hopefully soon) I’ll look at the forum to go with it. So just uploading the 20 ways templates as is will not change the buttons to the green buttons in the 20 ways files? Just wondering why all the other buttons showed up “out of the box” when installing and the submit order button won’t? What is the define statement for the button you included in the 20 ways templates because that is all I am trying to use. No special buttons just the included buttons? The Submit Order button is completely new. There never was a submit order button in zen cart (zen cart calls that button “confirm order” out of the box). A new define statement had to be added to the buttons.php file and the last page of the checkout (confirmation) had to be altered to allow for the new button. These elements should be in the install from the go. If you want to work around the way I set it up then you could simply change the current “confirm order” button to a “submit order” button and you will achieve the same effect. I am going to post a version here eventually that makes it a little easier for some to install. There will be no real changes, just a few minor tweaks to address the button issues some users have run into. The define statement I used in the 20 Ways template can be found in your “buttons.php” file (in your template directory). It points to the new buttons used. Thanks very much for this great modification. I’ve installed it and feel that its an important step towards improving my conversion rate. I had some frustrating problems with Paypal Express Checkout “redirecting” the user away from the new login page, and back to the split login. For anyone else who experiences this, the fix is pretty easy. (And still complies with their TOS). Great value for money. Would have taken hours to work out how to do that lot. Only just installed it so not sure if it will actually make a difference but I think it will. Only problem is that I have now lost paypal as a payment option. When I switched Paypal express off, it also disabled the paypal option from the payments page. looks like the previous person to leave a comment had the same problem but his code didn’t show up here! Did you turn PayPal express to ON (if you are using it) but turn the split login off? Thanks very much, the changes to the code set me off on the right foot. I couldn’t get the Paypal Express button to sit correctly on the shopping cart page though, although I have put it in it’s own distinct box on the login page. Again, I must say I really like the info you have made available here. I have never once bought an ebook of any type until now. The way you marketed it was excellent. Your funnel worked very well, I read the free book explaining the changes and just I was about to put it aside thinking, “one day I might do that”, I spotted the link to the ready made code. Brilliant. Only criticism I would have is that I think you should bring the code upto date with 1.38a ( I think your code is slightly older – correct me if I’m wrong). Also I don’t think you included images for the checkout progress bar thing. I downloaded the latest version of this (which featured quite a few code changes). great work though, really feel like I have given my site a lift, lets hope that sales over the next couple of weeks so the conversion increases I’m hoping for. Then it’s on to tweaking I guess. I have just installed the 20 ways packet. The problem I am having is that the order steps are showing up on my hone page as Step 3 of 4. When to to the login page is reads Step 3 of 4: Review & Submit order. I have check the location of all the files to make sure I have place them in the proper directory within the proper sub directory. Any suggestions as to what I have done wrong. Currently the site in on my local computer under construction. Also my login page looks like the pdf in the book but would like to move both more to the center of the page. Any suggestions. That portion of the code is controlled by the language files. Make sure you have those set correctly. it sounds like you are mixing or crossing over language files for those pages in question. To make alterations to the login page you’ll want to work with the “login.css” file that is included with the package. I noticed that in way #7 you have included the shipping directly on the shopping cart page. I would like to impliment this step but noticed its not in the companion guide. I am only half able to impliment it; I have added the shipping calculator to the shipping cart page but do not know how to remove the shipping estimator button or the postcode and state fields so it looks streamline like in the example. thanks Eric, I just found that. Although, doesn’t that still leave you with the postcode & state fields? I have removed these fields but thought other may want to know what to do here. Imade alterations to the shopping cart default php. I looks like when I have both Express Checkout, and Websites Payment Pro enabled I get two PayPal payment options. PayPal Logo [ ] Save time. Check out securely. Pay without sharing your financial information. PayPal Logo[ ] Checkout with PayPal. The safer, easier way to pay. I was wondering… is there a way I can get ride of the duplicate PayPal payment option? I would like the second instance of PayPal to go away. The 20 ways conversion pack has works great! Thank you. Yes, in this case since you are seeing two (the default WPP version takes preference) you can edit the “tpl_login_default.php” page and “comment out” (using standard html comment tags) the section of code which inserts the “PayPal” checkout option. You’ll find this in two sections … you want to comment it out of the second section. I think you meant edit out the second PayPal Express section on the tpl_checkout_payment_default.php page. Thank you for both free ebooks and template conversion pack. I have installed and try to implement both. However, I encounter 2 problems. 2) How to do SUREFIRE WAY 7 ‘Include actual shipping amounts on the checkout page’? I could not find it anywhere from both ebook on how to do it. 1. The book that comes with the Conversion Pack mentions how and where to make the edits. i too had the missing button issues, but figured it out by editing my original button_names.php file instead of uploading the new one. but one of the different problems i’m having now, that i hope should be easy to fix, is this: I have the checkout pages working correctly layout-wise, but the top of Page/Step 3 says “GIFT CARDS” when it’s actually the “review and submit order” page. it’s a problem because at the top of Page/Step 2 of checkout, it ALSO says “GiFT CARDS” (which is correct for that page). However, to make it less confusing (because you can also enter discount coupons/redemption codes on this page along with the gift cards), I’d like to change the wording to say something else…maybe whatever it says Step 2 is on the little progress bar thing. also– i have paypal express checkout as my only payment option because i have too small of a business to afford a merchant account at this point…..and on the initial cart page (that shows up when you click on “View Cart”, right above the actual “Checkout with Paypal” button, it has bits of what look like alt text from a paypal button that doesn’t show? says something like “PAYPAL_EXPRESS_CHECKOUT….” etc. figuring that’s an issue with the button_names.php file? but I didn’t change anything with that one, or even anything near it. Is there a file included in the pack (maybe css?) that’s telling it to display something there? hoping you can help, or at least point me in the right direction… thanks so much for your time! Sound like somewhere during install you crossed the language define file name with another. Specifically the portion of the language define that deals with the Gift Certs. Look for the fix in either the language file (I recommend you use your own previous version and add the new changes if any to it from the pack.) You might also want to take a look the language files that came with the pack that have the ‘name of the page’ in them (like ‘checkout_shipping.php’, ‘checkout_confirmation.php’ etc…) These have areas for headings which related to the checkout page headings. Again, this means you are missing a portion of the language file which ‘defines’ that section of the page. I would recommend this as it sounds like you have made a number of changes to previously working language files which caused these issues. Start from the beginning (using the backup files you created before you actually made any changes). THEN, manually migrate the changes from the language files in the pack with those in your pack (comparing each with the other to determine what alterations should be made.) This is easier than it sounds, but you have to be careful when doing so. I do offer install services for this if you are interested (just a thought in case you get in a bind). If interested in that let me know and we can connect via email to work out the details. Sounds like the rest above. If you altered any language define that referenced the old image you will find it is now gone. You’ll need to work the proper filename back into the mix to get it to show again. The only other reason this might be caused is if you turned off the position of the ‘x’ from within your admin section. If you did that, the entire image (regardless if there is an image present for it or not) will be gone. super glad you got it working! I have a question about Zen Cart, what is the price per month to have Zen Cart, I have heard this is extremely expensive. For the 24.95 exactly what do we get. I am getting ready to open my store and web site, but the shopping carts are expensive and I can’t afford to pay hundreds of dollars for a shopping cart. Zen Cart itself is free. I’m not sure who told you it was expensive but that’s not the case. Having said that running any business does taking cash investment to some degree. You have to spend money to make money. If done right, the more you spend the faster you grow. I would recommend first putting your plan together, then getting the cart in place, then focus on the other aspects. I can help you with this if you want. I think you would really benefit from my online coaching system which has helped others in your position build very successful businesses.